A few more visits to the H.Avon in less than ideal conditions hot hot hot. The H.Avon has been calling for me to chase the chub and barbel. I fished with Andy and we both blanked, not uncommon that. I spent 5 hrs walking before wetting a line. Andy’s knees have been playing up so he can’t do all the walking. The next visit saw me arrive on a very hot day again 28c with thunder forecast for later in the day. I walked again for a couple of hrs and found 3 swims where barbel could be seen. All were chasing pellets that were thrown in. I was in no hurry as to cast out with them in the swim is curtains as far as chances go. 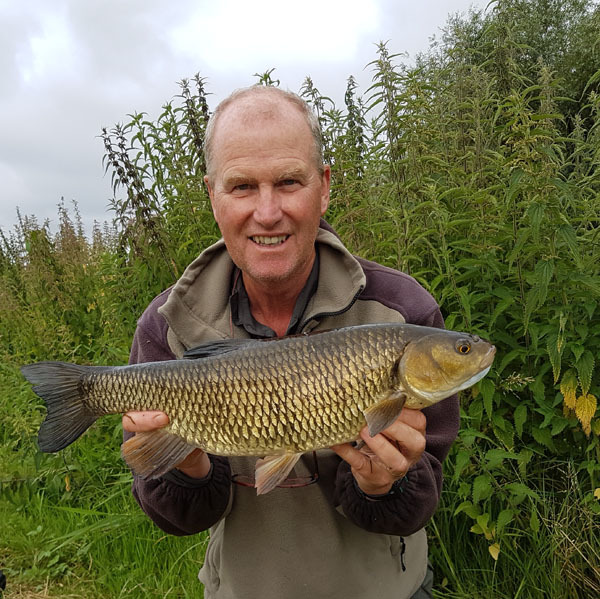 First cast made and a few pellets scattered and soon enough some barbel came out with one looking much larger than the others. They were all over the hook and bait but nothing happened. On reeling in one hour later there was a gudgeon hanging from the hook. Bugger or words to that effect. I waited another 30 mins before casting out again when no fish were present. A few more pellets followed and out they came to feed. Within 10 minutes the rod lurched over and what a fight in the shallow fast running water. 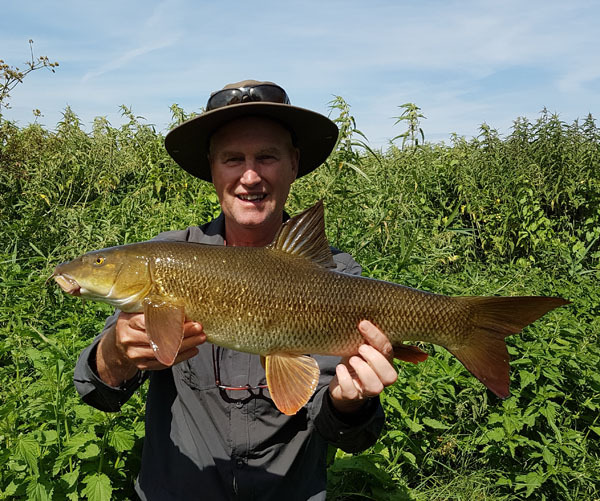 I could see it wasn’t the biggest one but a barbel in these hot conditions was a right result. On the scales it was just under 7lbs. So that was it I saw the big girl remove herself from the swim during the fight and not much chance of another one so a move was made to one close by. The routine was the same cast out first and then introduce the pellets. The cast was spot on and straight away a barbel came to look at the bait and pva bag of pellets. 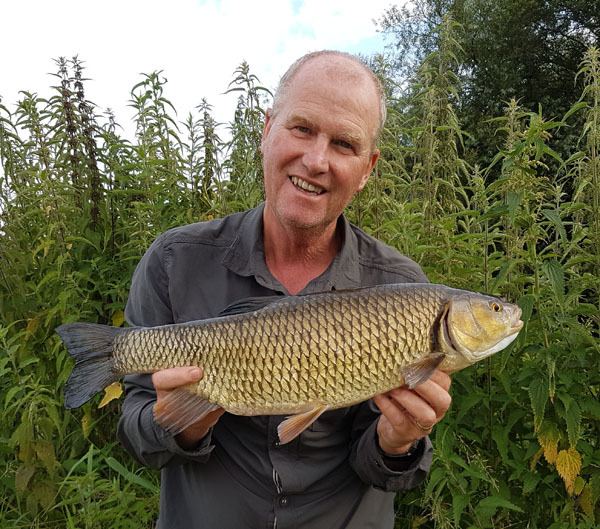 I scattered a few more pellets and soon 4 barbel came out to feed and bingo they were straight onto the bait and again after 10 mins the rod was lurching over as a barbel powered off under the weed and downstream. 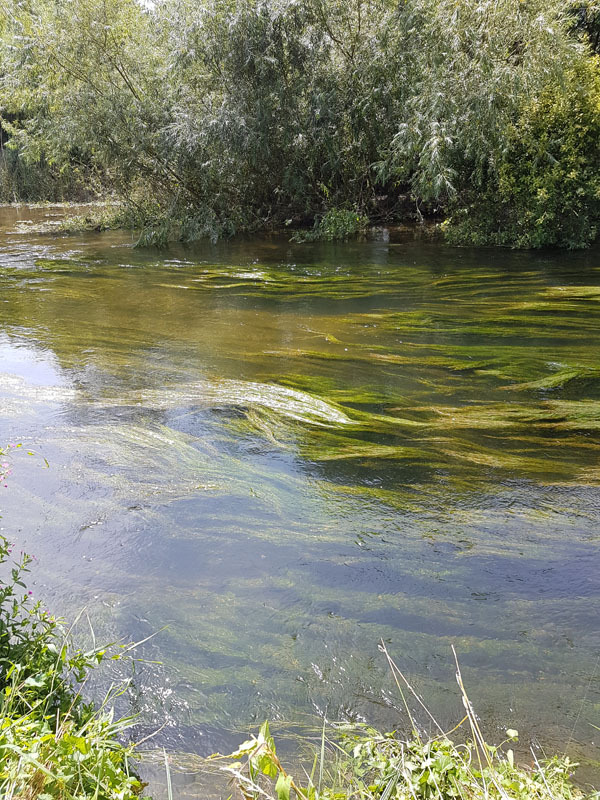 There was thick weed between me and the fish and if I went downstream it became thicker. 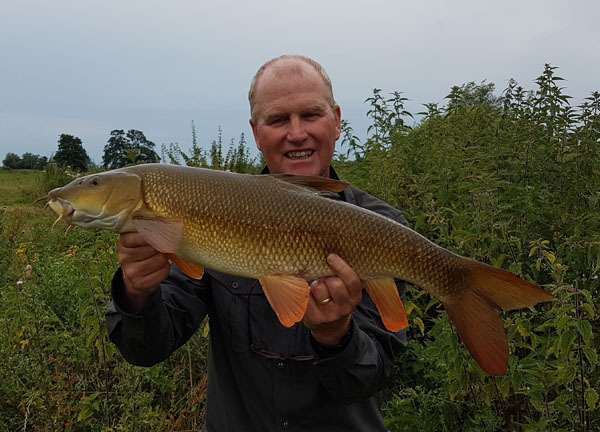 I’m unsure how I managed to land the barbel but it flipped up onto the weed and slid across unable to get a purchase as there was little water for the big fins to generate any power. The fight was right under my feet in clear water. LOVERLEY. On the scales it went just over 7lbs. There was a bigger girl in this swim too however that’s the luck of the draw. Next swim was a long walk to another area where I had seen some barbel, well 3 and one was a very big fish indeed. Here I was to be fishing a couple of swims so I baited with just a handful of pellets to see what happened in each swim. I rotated from swim to swim looking and watching the bed of the river intently. Just the one swim induced the barbel to feed. It was shallow again with a little cover on the far bank. I waited for about 30 mins before casting out once I couldn’t see any barbel. Then went in some pellets. First out were some chub and a big one at that. Then 3 barbel came out and started feeding. Within 15 mins one had made a mistake and the rod took on a great curve in the shallow fast flowing river as it tried for the far bank cover. It was strong for sure and took line as that tail was wagging it towards certain danger for me and a snag. However the rod and line did the job as I always set up the clutch before fishing and know that I can apply maximum pressure. 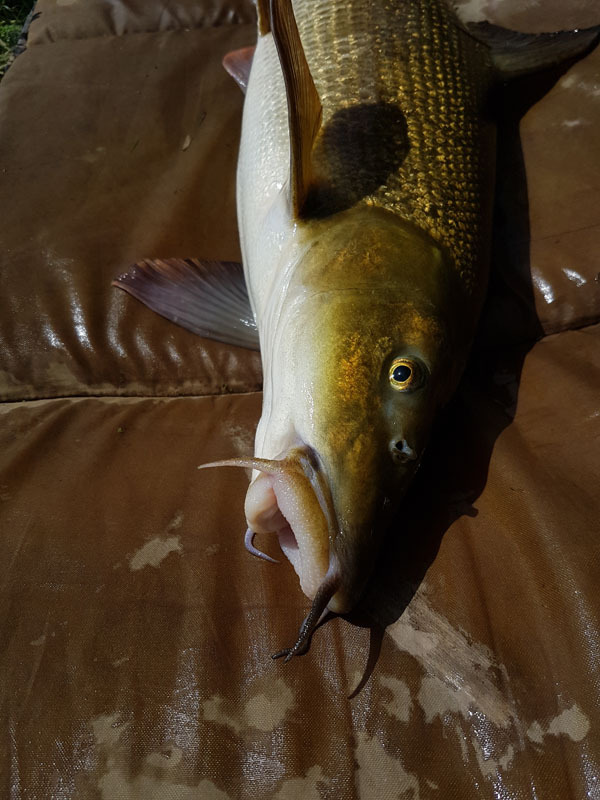 It looked a beautiful barbel but not the biggest one. However at 8lbs 3oz still another barbel and 3 in one day was a great result. I suppose you can say I was unlucky, however next time I could catch all the 3 big girls and not small ones. I then spent the afternoon walking and talking to anglers and watching as the sun became duller from the gathering black clouds coming up from the south. Thunder was coming!!! I spoke to Andy Little for a long time and he showed me some chub feeding by the island. It’s great to catch up with people and I spend more time gassing than fishing sometimes. It got to about 6.30pm when the wind got up and we could hear thunder in the distance. I had a lengthy walk of a mile or so and Andy didn’t want to get wet so we said good bye and head rapidly back to our cars and home. So a great result for me today. The next day I was back on the river, one where the nights previous rain made no difference. First off I stopped off to talk to Hugh Miles whom I had not seen since the previous year. He was tenching and caught a pristine little rudd while I was there. I spent 45 mins with him chatting away. It’s always a pleasure. Next I walked for miles again looking for barbel. Not satisfied I went to another location near Ringwood and found some huge chub and 2 large barbel feeding some pellets I had thrown in. Again I walked and looked and saw a couple more. The plan was to fish for the 2 barbel and huge chub. Within 30 mins of casting out a huge chub took the bait snagged me I think then bent the hook and was away. That was the last I saw of them from that swim. I then moved downstream to concentrate on a couple of smaller barbel, however a small chub put pay to all of that. It was 2.30pm now and I had one last chance of a fish back on the island swim. The chub were everywhere and the odd barbel came out to play but not seriously. I had a couple of chub one of about 4lbs. Then just before packing up for the long drive home a lovely one of 5lbs 6oz. So another day on the majestic Avon. I’m so pleased to be able to fish such a beautiful river with some good friends and fellow anglers. This entry was posted on Thursday, July 20th, 2017 at 9:49 pm	and is filed under Uncategorized. You can follow any responses to this entry through the RSS 2.0 feed. Both comments and pings are currently closed.